Give the gift of fun and games with these graduation playing cards. 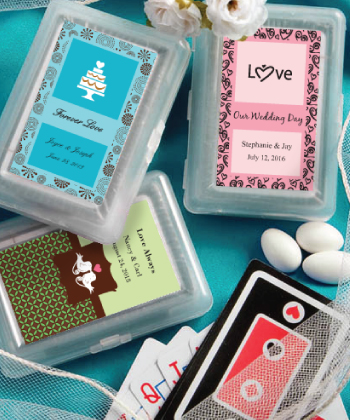 Each measures 2.5 x 3.75 x 0.75 inches and includes a full playing card deck inside a hard molded plastic case that opens like a book and provides a perfect place for you to apply a customized label of your choice. 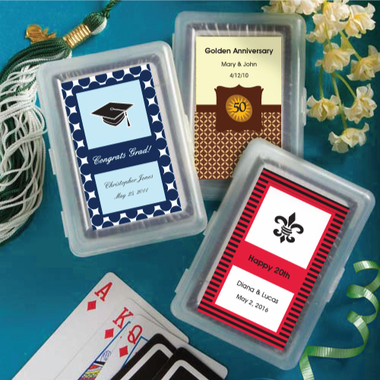 Your friends will love these unique graduation favors. Please be aware that only the label is personalized, the cards themselves are not. Labels come in sheets that you place on the plastic case . See the lower inset photo to view the black, red and white suits design that is the standard on the playing cards.